But like several Democrats on the Senate Banking, Housing and Urban Affairs Committee, Sen. Jon Tester challenged the nominee on her promise to pursue, if confirmed, transparency. Kraninger said it was “inappropriate” for her to go beyond descriptions of OMB’s role in budgeting on policies issued by the attorney general. She stuck to general statements such as, “I will take aggressive action,” adding that Mulvaney has information she does not yet have. “It’s not appropriate to comment” on individual staffers, she said, promising to talk to every CFPB employee about what they’re working on. The Democrats’ questions, however, extended beyond the expected topics of payday lenders and student loan issues in the bureau’s purview. Sparks flew over the more dramatic policy fights over her current White House role in the Trump administration’s separating of children from undocumented parents at the border and disaster relief to hurricane-ravaged Puerto Rico. Kraninger’s opening statement included four priorities: be fair and transparent in rulemaking and cost-benefit analysis; work closely with other financial regulators and states to reduce fraud; protect Americans’ private data; and spend money wisely, paying attention to the congressional oversight. The day before the hearing, Heitkamp joined with all Democrats in requesting a postponement of the hearing until the White House turned over requested documents on the nominee’s OMB work, a request the White House ignored. But Chairman Mike Crapo, R-Idaho, said he wouldn’t expect any administration to release documents on a deliberative process. “This is an issue that goes beyond this nomination process,” he said. 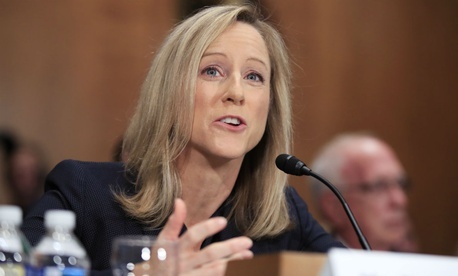 Warren before the hearing published a report highly critical of Kraninger’s qualifications and noting that at OMB, Kraninger proposed a hypothetical cut of 23 percent, or $147 million, at the consumer bureau. Warren said she would put a hold on the nomination. “Would you fire civil servants?” she demanded at the hearing. “You’re playing dodgeball here.” Kraninger mentioned only that she would look for efficiencies, noting that federal employees have rights. Reactions to the hearing suggest that few minds were changed. CORRECTION: The original version of this story misattributed quotes that were from American Banker.